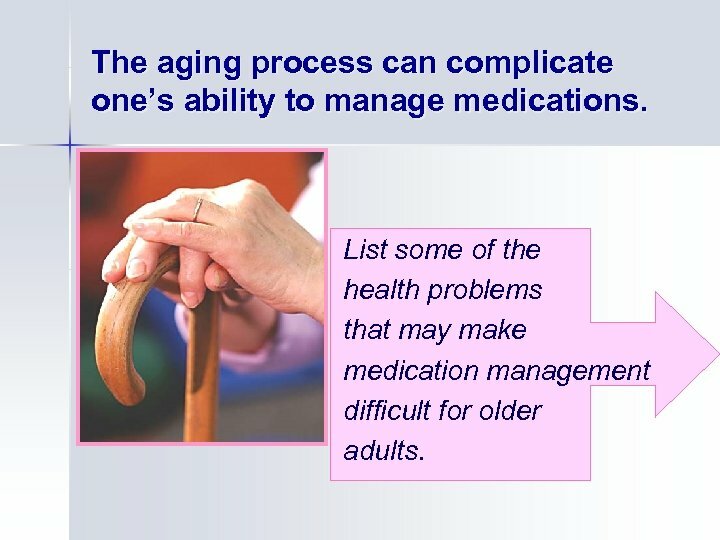 The aging process can complicate one’s ability to manage medications. 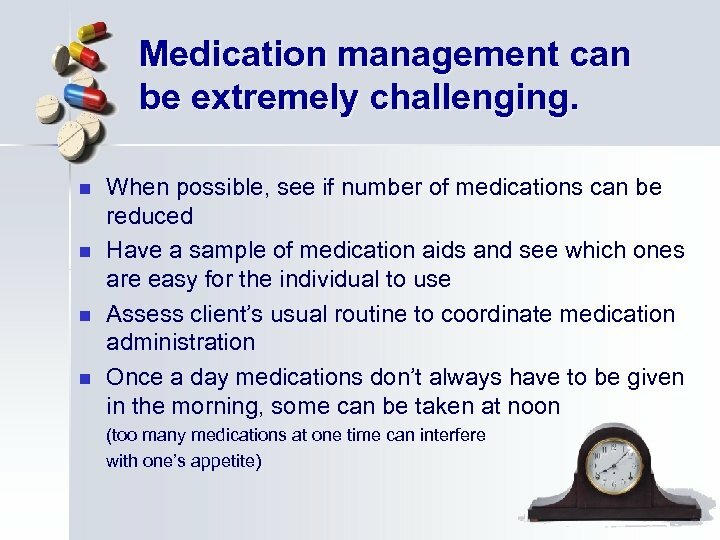 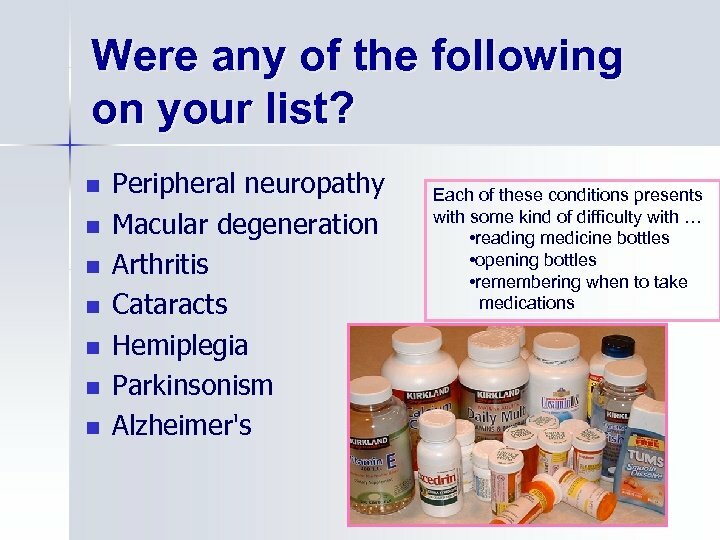 List some of the health problems that may make medication management difficult for older adults. 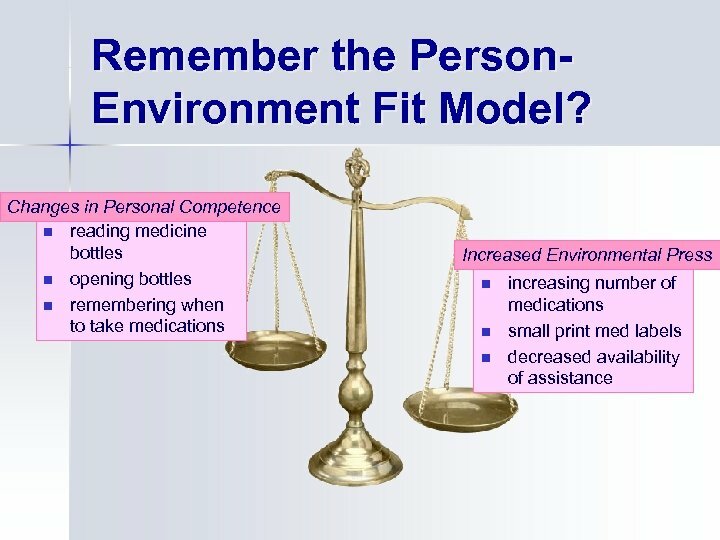 The person-environment fit model can help with the selection of the most appropriate tool to manage medications. 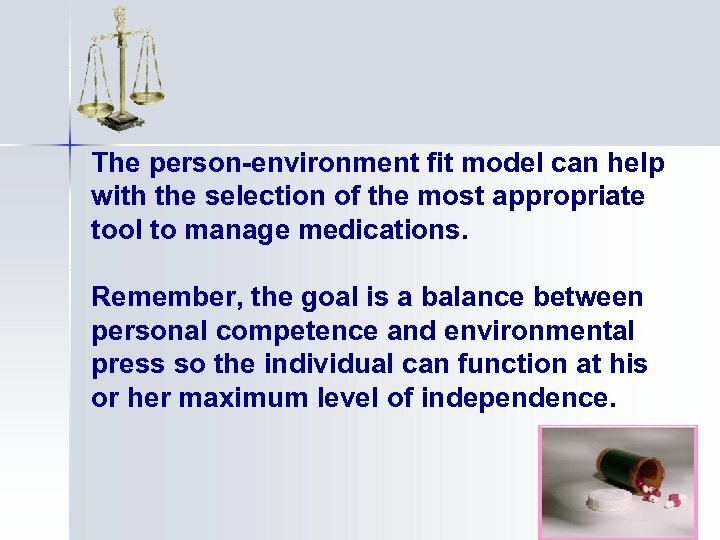 Remember, the goal is a balance between personal competence and environmental press so the individual can function at his or her maximum level of independence. 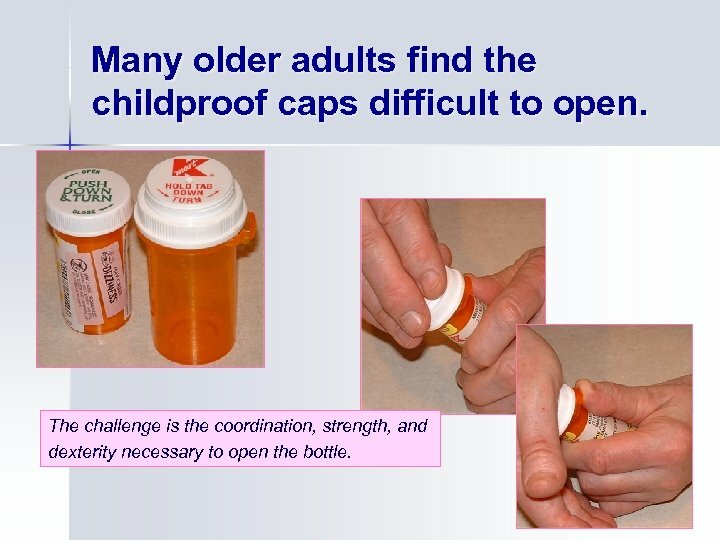 Many older adults find the childproof caps difficult to open. 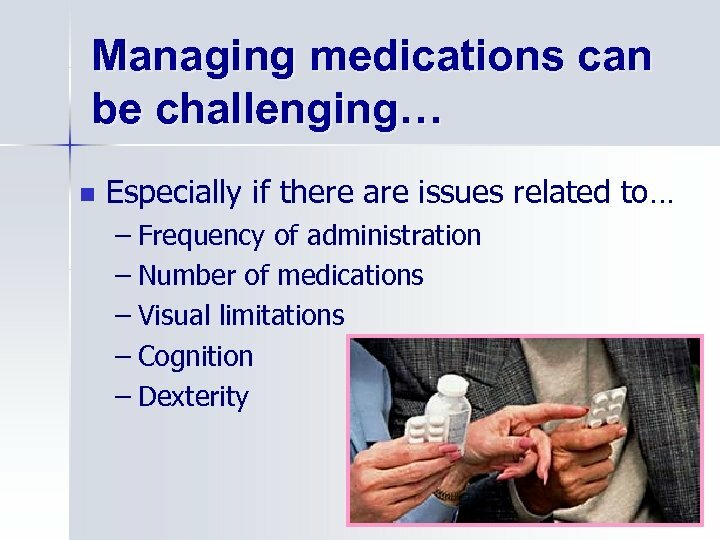 The challenge is the coordination, strength, and dexterity necessary to open the bottle. 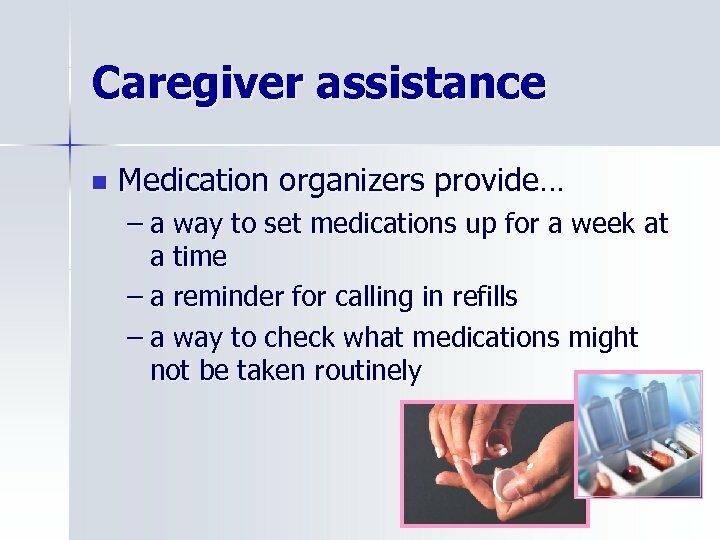 Those with arthritis benefit from having the pharmacy turn the childproof cap around so the bottle cap can be twisted off easily. 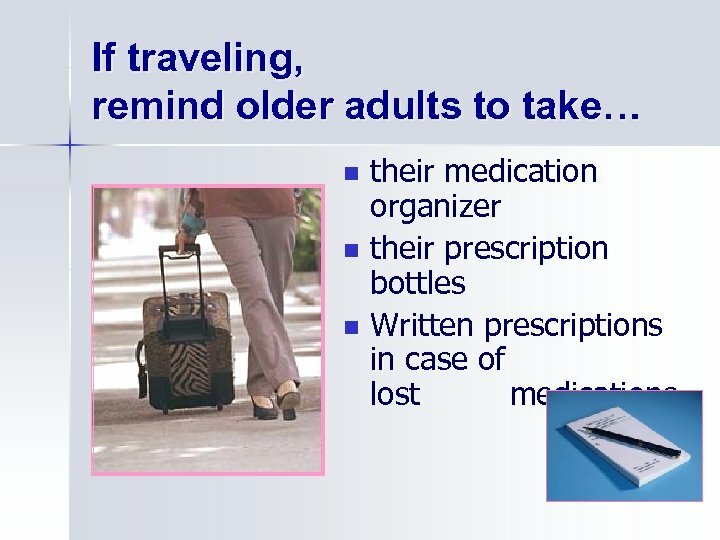 However, caution should be taken if children are in the home. 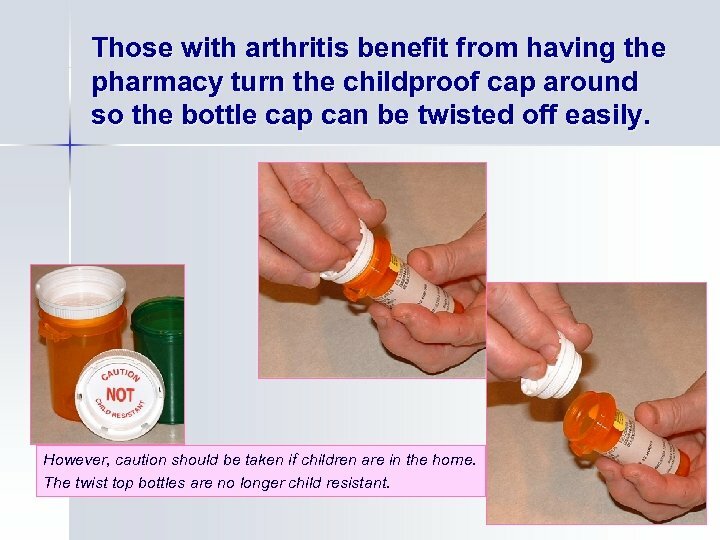 The twist top bottles are no longer child resistant. 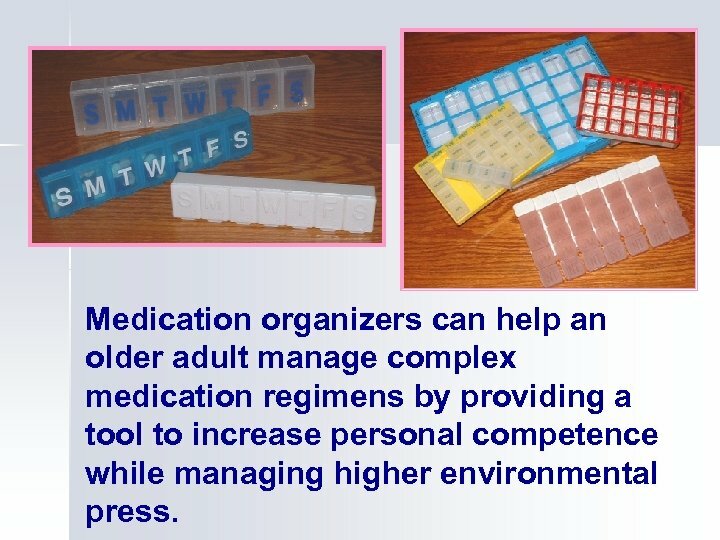 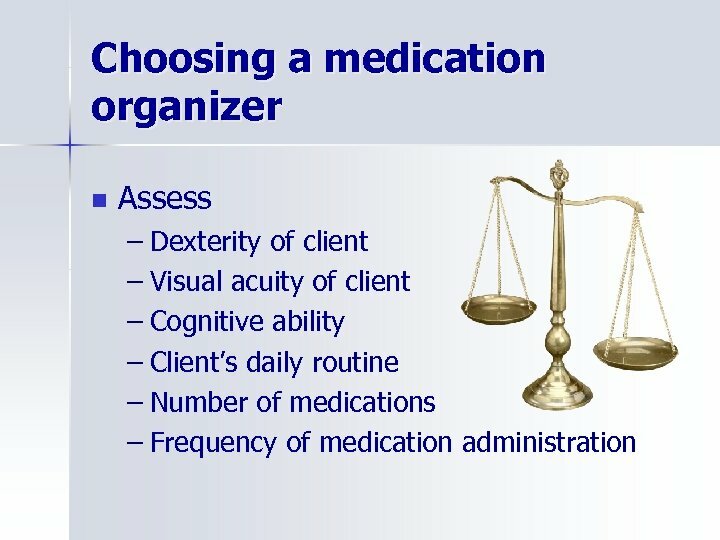 Medication organizers can help an older adult manage complex medication regimens by providing a tool to increase personal competence while managing higher environmental press. 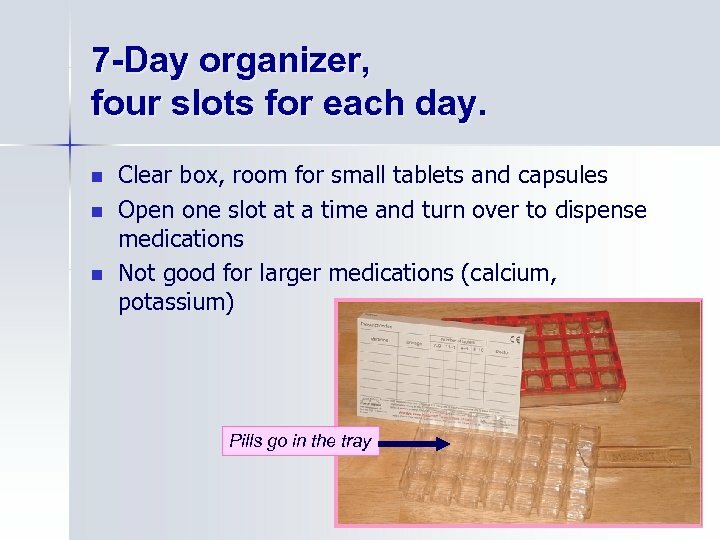 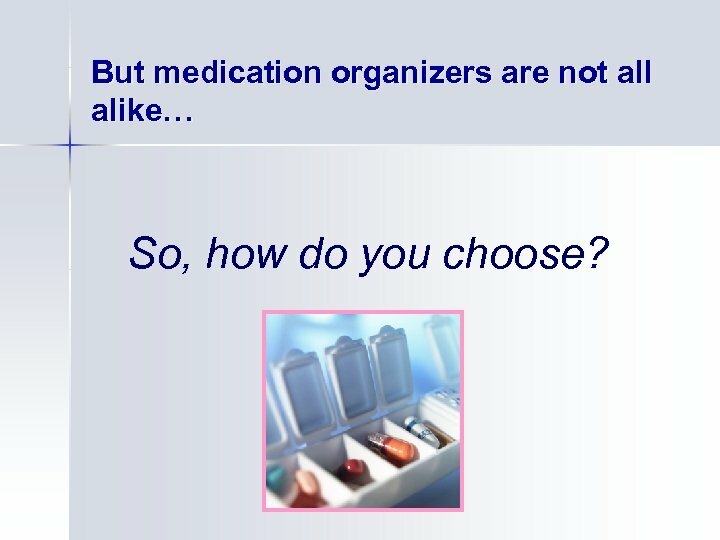 But medication organizers are not all alike… So, how do you choose? 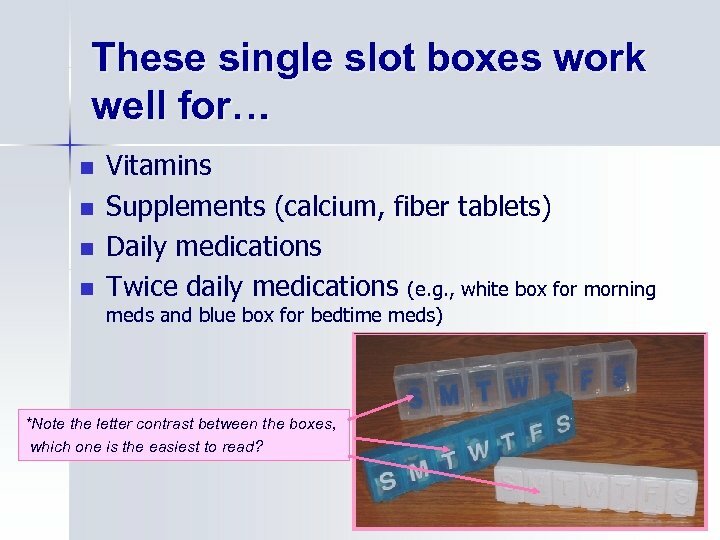 These single slot boxes work well for… n n Vitamins Supplements (calcium, fiber tablets) Daily medications Twice daily medications (e. g. , white box for morning meds and blue box for bedtime meds) *Note the letter contrast between the boxes, which one is the easiest to read? 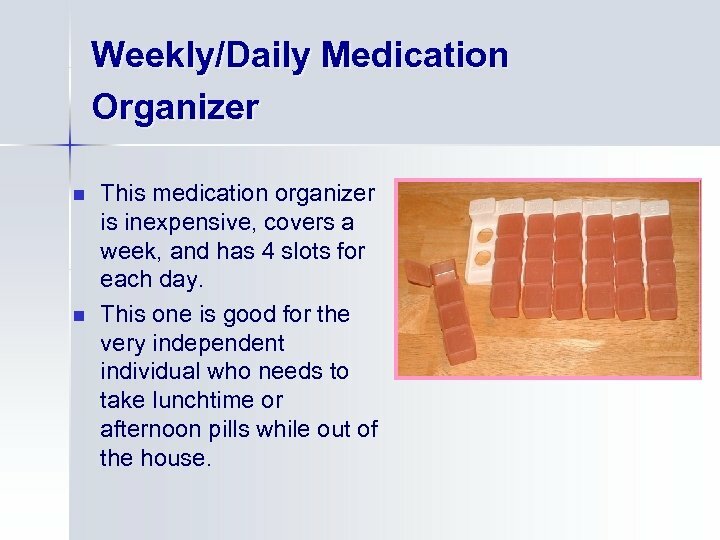 Weekly/Daily Medication Organizer n n This medication organizer is inexpensive, covers a week, and has 4 slots for each day. 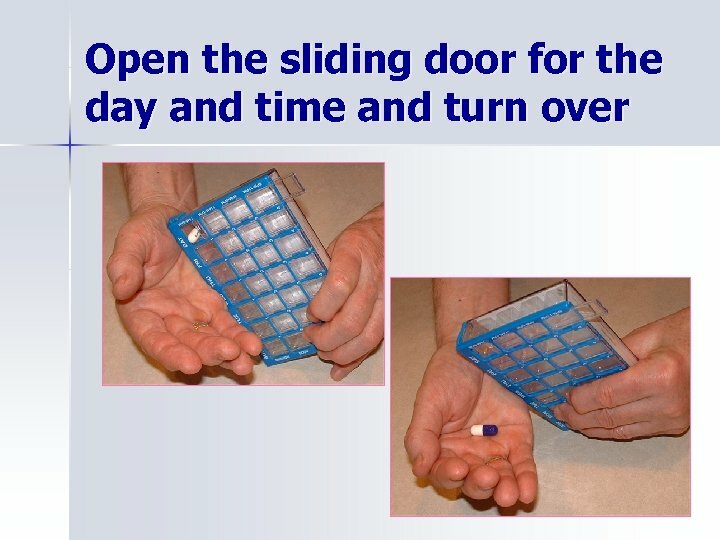 This one is good for the very independent individual who needs to take lunchtime or afternoon pills while out of the house. 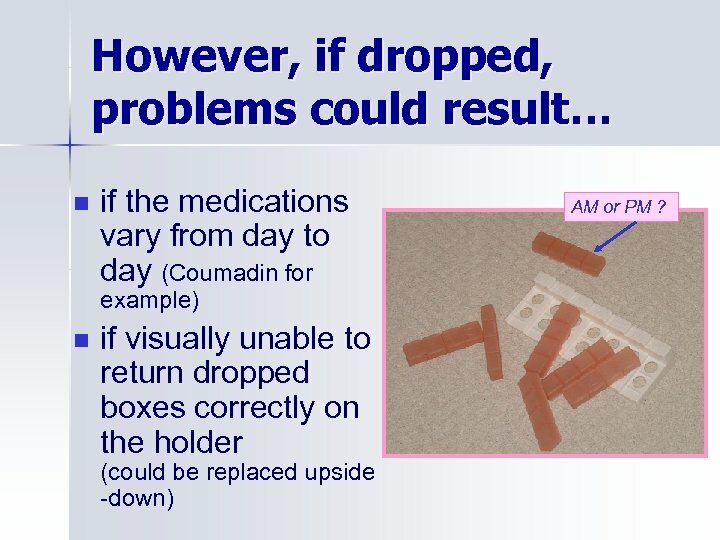 However, if dropped, problems could result… n if the medications vary from day to day (Coumadin for example) n if visually unable to return dropped boxes correctly on the holder (could be replaced upside -down) AM or PM ? 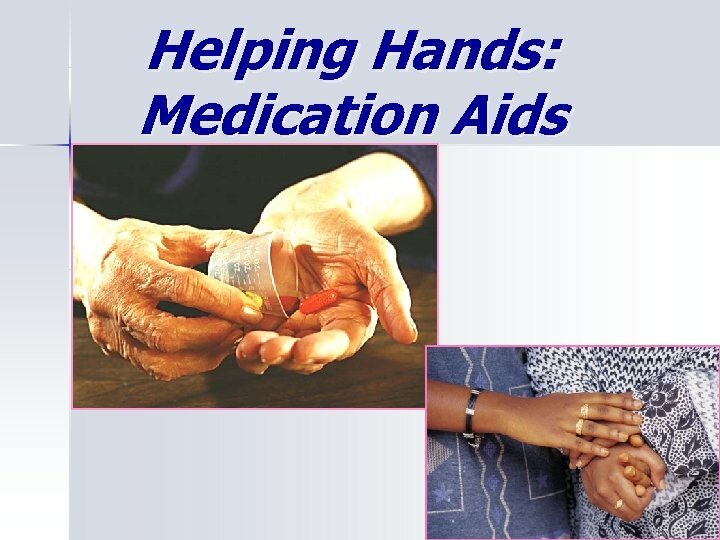 Helping Hands: Medication Aids was created by Catherine Van Son, Ph. 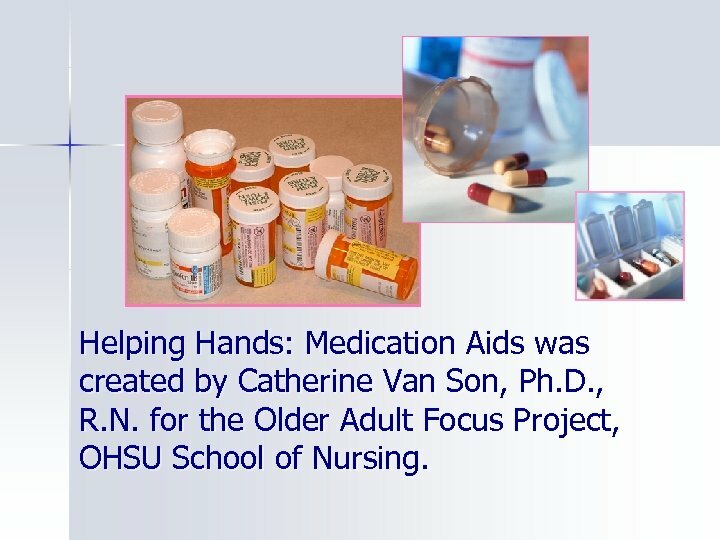 D. , R. N. for the Older Adult Focus Project, OHSU School of Nursing.